Big Brother Canada 5 is slowing down and looks soon to be screwed by a triple eviction but this episode was still nonetheless very entertaining to watch. Let’s get right into our latest episode recap with a POV, the demise of a major character and plenty more to discuss. Dre Wants Ika To Stay? After weeks of claiming she wanted Ika out of the house, Dre suddenly was starting to regret those words. She started to think that maybe keeping Ika around would be best for her game. She declared “I think it’s good for my game if the vets stay”. But I really don’t see it that way. Dre is running these “newbies” and is still in a great position to avoid the block during that triple eviction. If Ika was to stay this week, she’d still have Demetres and probably Kevin before she turned to Dre. But with the way the game is going, the vets will be gone after this triple eviction is over and Dre is perfectly positioned to go all the way to the end. So luckily for her, her flimsy-floppy behaviour was not punished, especially with the result of the POV competition. This was the POV competition that Kevin had been studying for all season long. The house-guests have been given several chances to prepare for it by making it relevant on three separate occasions this season, but Kevin studied harder for it than anyone else. However, since he didn’t want to get any blood on his hands, Kevin threw the competition. As a result, Demetres who hadn’t even done that well and at one point almost gave up because he thought he had lost, won the Power of Veto! With the veto in his back pocket, The Greek now had a tough debate about what to do with it. He could save himself or use it on Ika in an attempt to try and save them both. Since he won, Demetres also gets to spend some time with a jury member of his choice. That’s going to be awkward when he goes home tomorrow without being given his chance to do so. Demetres is going to be given plenty of time to spend with the jury starting tomorrow…unless he wins veto or HOH which is actually pretty likely given how good he is at competitions. If he is to win this season, The Greek is going to have to Mike Holloway it all the way to the end. 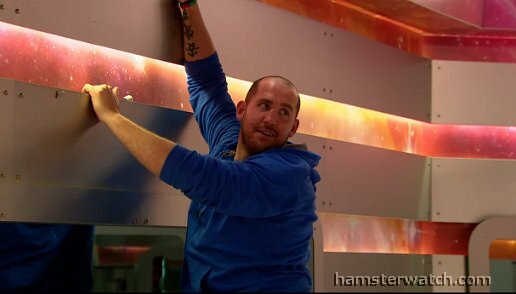 Meanwhile Kevin was overjoyed about the fact that Demetres had won the POV. First of all, he was happy that Demetres was going to stay in the house, be the biggest target and be someone that he could work with. But he was also happy that The Greek was only increasing the target on his back now that this is the fifth week in a row that he has been immune. Demetres winning power is pretty great for Kevin, but sadly it won’t be enough to keep him off the block in the triple, as even if The Greek were to win HOH he’d probably still nominate the poker player. Is Dillon In The Best Position??????? After the veto competition, the houseguests were given a party for no reason at all just when Kevin had made supper for everyone. The one thing to come out of this weird party was Dillon showing more of his lovable side once again. It just seems as though Dillon is kind of like the goofy guy in the house that everybody likes. You wouldn’t really think so, but he seems to be a really sociable guy who has the ability to fit in with anyone. He’s friendly to everyone, is aligned with everyone and despite being a potential “physical threat” isn’t being targeted by anyone at all. So it may be shocking to say, but Dillon might be in the best position in the house, especially with the impending triple eviction. When the triple eviction comes this week, Dillon is one of the least likely to see the block as not a single person is really coming after him. But with all those power players expected to go home, he could find himself in an incredible position moving forward especially with his decent ability in challenges. It would probably be a worse outcome than both the Paq’s Bros and Sarah Hanlon but Dillon Carman could actually end up being the winner of this game. Before the veto ceremony, we were given Ika’s back-story about immigration from Jamaica, which was nice to hear. It is one more reason and one more reminder why it is going to be so sad to lose Ika Wong this week. She has been the main protagonist on the show all season long, has just been amazing to watch and has possibly played a better game than anyone else. However, with Demetres winning power she was unfortunately always going to be the one to go home this week. This is again unfortunate especially given how she was the main reason for the massive flip against the power players in the house, starting with Neda, then Sindy, then Bruno. She’s also been the main protagonist on the show all season long! But the game has just caught up to her and sadly she is almost certain to be evicted this week. Dre however tried her best to make Demetres use the veto on Ika. But The Greek did not want to become the fool of the season and so he refrained from doing so. Demetres instead took himself off the block and in his place, Jackie went on the block. Ika had some fighting words to say about it as the episode came to a close but it is very unlikely the ‘professional pizza maker’ will be going home. So with a triple eviction Thursday night, this season looks like it is about to get screwed over just like BBCAN3 was after its triple eviction. The triple eviction didn’t go over well with anyone last time so it is baffling as to why they brought it back. Karen and Jackie even said so themselves this week inside the house this week. Sure it made for amazing TV, but it completely ruined the games of two very capable players and laid the groundwork for the beginning of what completely ruined BBCAN3. As far this week’s elimination goes, Ika Wong is destined to go home. She’s been amazing all season long and has certainly elevated herself up to legendary status as far as Big Brother Canada players go. If there was one fatal flaw in her game it was in making herself the biggest target in the house so much that even her best allies like Dre wanted her gone. Nonetheless, when Ika goes home tomorrow it will certainly be a very sad day. Thanks for reading and I will see you next time! The next episode recap will be coming Friday morning rather than Thursday night as I will unfortunately be unable to watch the triple eviction live. See you then!